Every day we sit together over lunch. We have a big table and we either bring leftovers from home or go out to grab something in the neighborhood. It’s a really nice 30 or 40 minute break – the conversation usually is about movies or TV or politics. It serves to recharge us and has really helped us develop our nice little community. We are fortunate because the West Loop neighborhood where we are located in Chicago has some great places for us to get food. We have excellent Chinese, burritos, Thai, and we have great sandwiches. 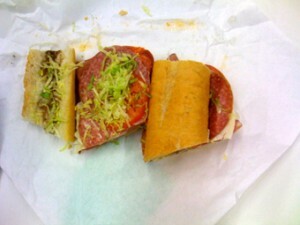 Jerry’s is a gourmet deli with a menu that includes ~100 amazing combinations of really nice fresh gourmet ingredients. We have a debate going between two places in the neighborhood, each of which makes fantastic Italian sub sandwiches. 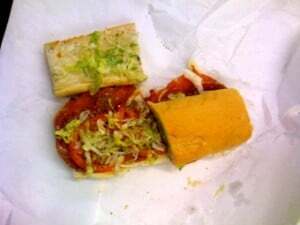 Vinnie’s is a classic Italian sub shop located on West Grand Avenue in Chicago. A simple counter with a couple little tables. They are all subs all the time. Simple, fresh ingredients, crafted by hand. Yum. A block or two east is Bari. Bari is an old-style Italian grocery with a deli counter at the rear of the store. They also serve up delicious subs, made to order. Here’s our assessment. Bari’s bread was superior – soft and crusty. The vinaigrette from Vinnie’s was a really nice touch, with the balsamic adding nice flavor and aroma. The giardiniera from Bari’s was nice, but a little too spicy/overwhelming. Turns out that Sean got the “hot” variety, it might have been less overwhelming with the mild. Overall winner: Sean and I agree that Bari was superior, primarily because of the bread. Not to mention 75¢ cheaper.